Professor Maynes discusses the findings of his study. 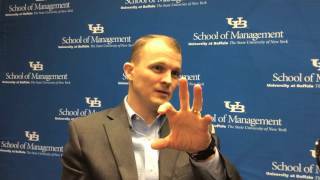 BUFFALO, N.Y. — When NFL teams draft players, the player’s willingness to go above and beyond the call of duty is just as important as the number of catches or tackles he makes, according to new research from the University at Buffalo School of Management. Forthcoming in the Journal of Applied Psychology, the study explored the traits that make college football players successful in the NFL beyond on-field statistics and included “contextual performance” – behaviors such as working harder than necessary, making personal sacrifices that benefit the team and helping co-workers with work-related problems. The researchers analyzed 440 college football players—218 wide receivers and 222 linebackers—who were drafted into the NFL between 2006 and 2012. They searched more than 36,000 media sources for articles spanning each player’s entire four-year college career to find instances where they acted as team players. Maynes says the study’s findings are applicable to any workplace involving teams like committees, task forces, product development or client engagement teams. The authors also found that while NFL teams consider these off-field characteristics when selecting players to be drafted, outsiders, such as sports writers tabulating draft prospect rankings, do not. In comparing the two approaches, NFL team selections more accurately predict player performance than draft ranking lists. The researchers say further research should analyze industries other than the NFL, to investigate best practices for hiring in non-team settings, and to take other factors into consideration such as national culture, and differences in hiring managers and team climate. Maynes collaborated on the project with Steve Whiting, PhD, assistant professor of management at the University of Central Florida College of Business.